This is a fresh variation on spice rub, with fresh rosemary and lemon zest building intense flavor. It keeps for a week in the refrigerator, and is delicious on fish or chicken. 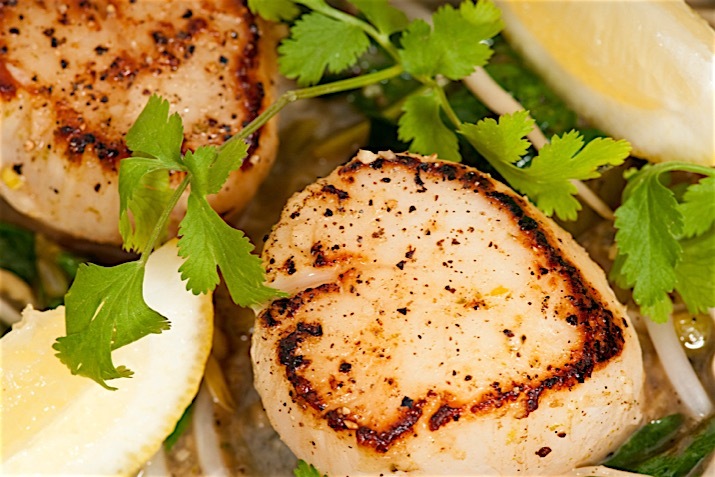 For these scallops, a simple sear builds a tasty crust to hold the sweet, tender scallop meat. Crush or grind the rosemary, lemon zest, peppercorns and salt coarsely using a spice grinder, food processor, or a mortar and pestle. Spread half of the spice mix on a plate and dip the flat sides of each scallop into the spice, lightly dusting the surface. Spread the remaining rub over the scallops and pat it on. Heat a large, heavy skillet until very hot, then pour in canola oil to coat the pan. Carefully place the scallops in the pan and sear; don't disturb them until the edges are turning golden brown and starting to split, about 2 minutes. Flip the scallops and sear the other side, about 2 minutes. Remove scallops from the pan. Serve hot. Serve scallops piled on a simple creamy pasta, cooked rice, or a bed of cooked spinach.